Use Discount Coupon Code LDDISCOUNT in the shopping cart to get a 10% discount on the Line Drafter when bought with any Combo. "Now...this is a tool I can use!" Whether you are a quilter, crafter or garment seamstress, you'll love this latest essential tool...the Line Drafter. What makes this different from other ordinary quilting rulers is the permanently attached handle. Get a good grip, it never will release (like suction cup handles often do). It's not visually obtrusive. It offers total maneuverability when drawing on both vertical and horizontal surfaces. 1. 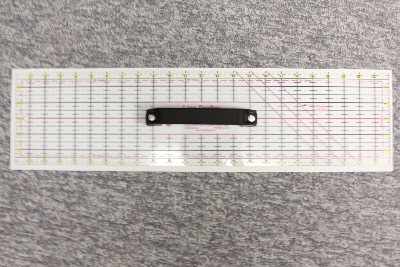 Dimensions: 6" wide x 24" long (15 cm x 61cm) - great for drawing long grainline markings. 2. Manufactured from clear plastic - it's easy to see through and great when working with the Sure-Fit Designs Tracing Vellum. 3. 1/8" thick plastic - rigid and stable for easy maneuvering. 1. Inch (Imperial) rule along all edges. 5/8" (16mm) seam allowance marks/lines on both long edges - easy to draw standard seam allowances on long edges: e.g. pattern pant legs. 1/2" (13mm) seam allowance mark/lines on one short end - offers an optional seam allowance width. 3/8" (10mm) seam allowance mark/lines on the other short end - great for sewing knits with narrower seam allowance requirements. 3. Grid lines 1" (2.5cm) apart throughout the drafter - great for quilter's and clothes seamstresses alike. 4. 45 degree angle lines - for drawing and cutting true bias lines - great for bias binding and designs such as cowl neck draping. The Line Drafter features a permanently attached handle! It's sturdy and has enough depth even for a large hand. It allows for extreme ease of maneuverability whether you are drawing or cutting on a vertical or horizontal surface. Watch the video below for more information on using the Line Drafter.